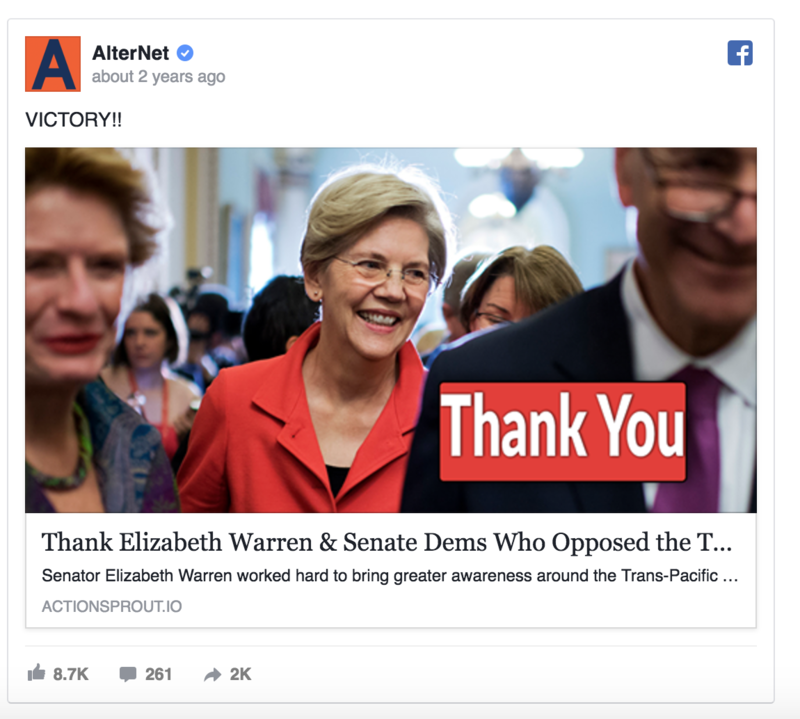 AlterNet recently launched a campaign to grow their mailing list with ActionSprout social actions. In a week's time they had already collected 7,000 supporter email addresses! Let's look at two of their most successful actions. As you can see, social actions are a powerful way to engage supporters and build your mailing list. If you're willing to put in the time and get in the practice of creating effective actions your hard work will pay serious dividends in the future. What if your organization isn't "a AlterNet?" Are these results still possible? Yes! List building isn't just for large, powerhouse pages. Post each action multiple times. This will increase the number of people who see your action and thus can increase your reach and engagement. Don't worry about the same people seeing your post every time either. Facebook has stated that a new portion of your audience will receive reposted content, making it hard to spam your followers. Keep things fresh with new actions. It's fine to create evergreen actions that you can post multiple times. (In fact you should be doing this!) But it's also important to be creating new actions that take advantage of timely stories and trending content. These types of actions tend to perform the best and will receive the most engagement. Shot for creating one new action a week and work your way up from there. Learn what kinds of actions your supporters respond too. 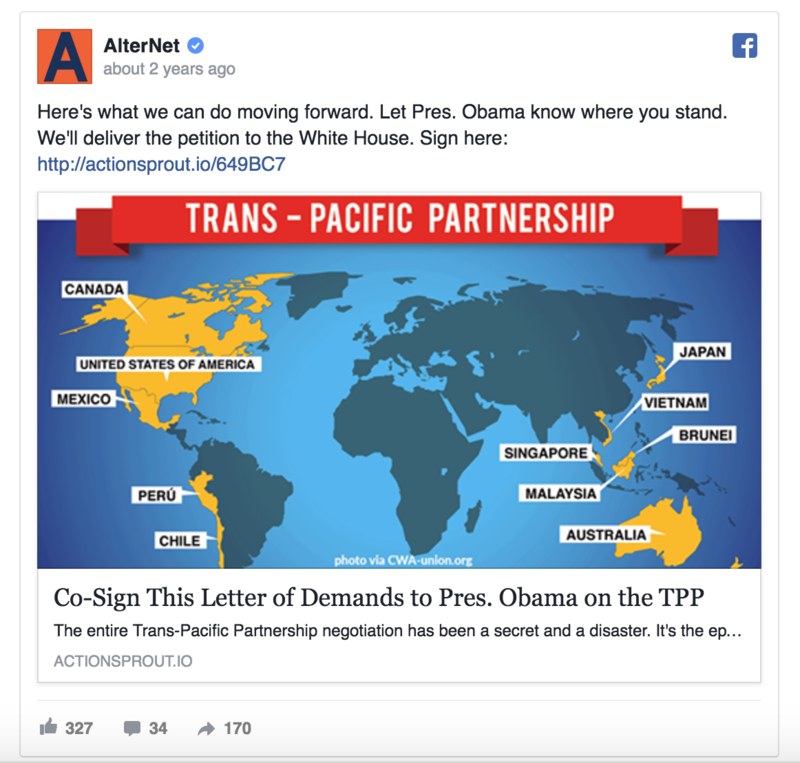 AlterNet tends to post petition and demand actions because that's what their supporters respond to. Your supporter might respond to letters and thank you actions. The thing is you'll never know until you test it! Be sure to test different action types until you hit on what works. Post an action to Facebook everyday. This follows the same logic as number one. The more your post the more opportunities your giving supporters to see your actions. Check your Facebook - Insights and learn what time of the day your supporters use Facebook. Test morning vs night to see which one leads to more completions. Finding your sweat spot may take time but it will be worth it in the long run. Always experiment and test new strategies. Facebook is constantly changing. What works now may not in 6 months or a year. The key is to stay fresh, try new things and keep up! There's no easier answer to this so have fun with it and listen to your supporters.